This morning as my beloved ACE rumbled into Pleasanton, as always I gathered up my scattered belongings at the almost-last-possible-second and flew down the stairs to the doors. And then, it hit me. OH NO!!!!!!!! MAH COFFEE!!!!!!!!! So I dashed back up the stairs, snatched my Contigo off the table, rolled my eyes and ran for the shuttle. 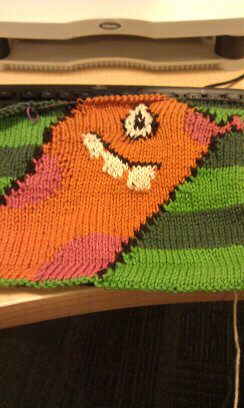 The rest of the commute, I worked on Captain Adventure's hoodie. At first, I was going to tear out and redo that eyeball of Googly's, because as you can see, I was asleep or something while doing it and it got puckered. I'm still not 100% sure about that call; kinda like it, kinda don't. But I'm going with it at this point, being so far in Intarsia stepped that to go back is way too tedious to contemplate. And now...gonna reheat my coffee and get the party STARTED at work. Woooooooooo, work par-TAY!!!! !